Goldfish are generally rated as one of the easiest fish to keep. However there are basic requirements for all fish that must be provided for the fish to remain healthy. Goldfish come in a wide variety of colours and shapes. Whilst most are capable of being mixed as they have similar water quality requirements, not all should be mixed. Mixing normal or comet types with fancy fantails for instance can result in the fins of the fancy fish being attacked. Fancies and fantails with thier long flowing fins and tails tend to be slower moving than the “normal” types and cannot get away from boisterous tank mates. A fish tank is a sealed system. With the exception of perhaps oxygen and carbon dioxide, which can enter and leave the system at the surface of the water, anything you put into the tank stays in the tank and nothing can get in unless you put it in. Put food in and you have added energy and nitrogenous waste (from the protein in the food). So the fish will grow (and so may plants) and the waste will build up. In a natural system such as a river or lake, this waste is washed away and broken down (recycled and reused by other organisms). In a tank it cannot go anywhere and you have to establish and maintain the natural waste disposal mechanisms to deal with it. Solid waste will build up in the gravel or sand and in the filter. Left alone a sludge would eventually build up and begin to rot, releasing toxic volatile organic compounds (VOCs). To prevent this is easy. Simply stir up the gravel at each partial water change (more on that later) or better still, buy a gravel cleaner that cleans the gravel as you remove water for the water change. 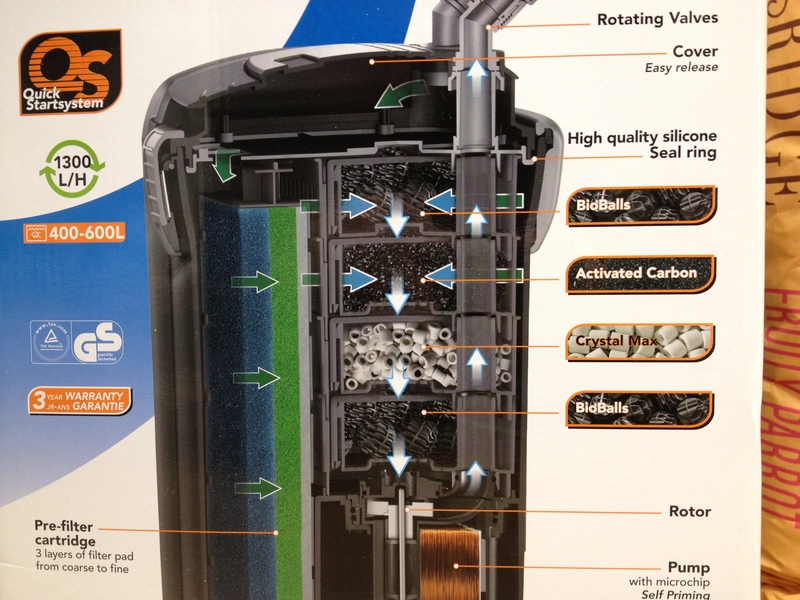 Every second water change rinse the filter element in the water you have taken out to remove the solids. Do not rinse under the tap. This will kill all your lovely beneficial bacteria and you don’t want that. Some filters also contain carbon. This does become saturated and will need replacing periodically. The same is true if there is a nitrate removal sponge. Leaving this in for too long will seriously effect water quality. Dissolved nitrogenous waste is released into the water by the fish in the form of ammonia. Ammonia is highly toxic to fish so it has to be removed. Bacteria that eat the ammonia live on the surface of the gravel and in the filter medium. They break it down into nitrite, which is less toxic and then into nitrate (much less toxic). Nitrate is plant fertiliser. 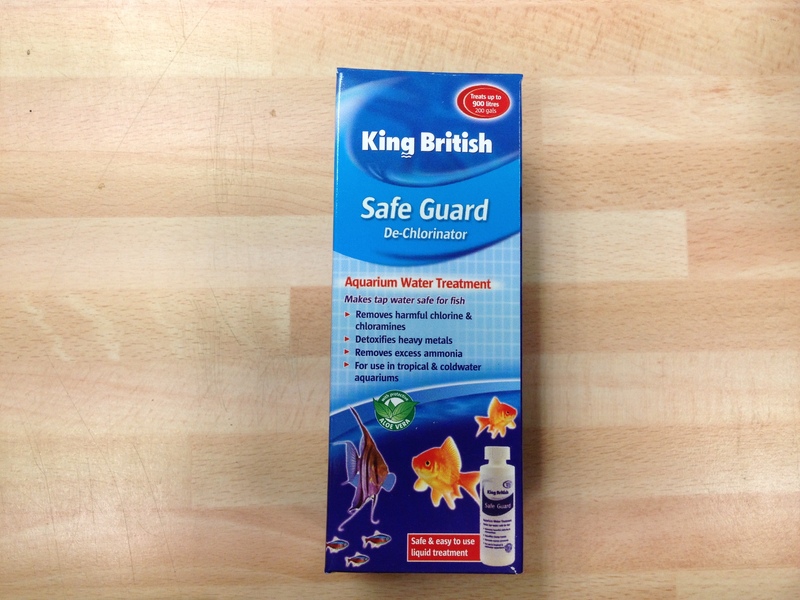 If you do not remove this then your tank will suffer from excessive algae growth. For this reason and those already given you should carry out a partial water change (remove some of the water and replace it with fresh, i.e. 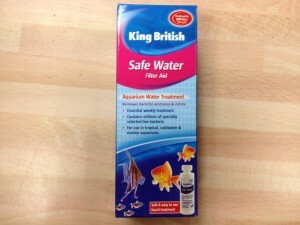 treated if using tap water) every couple of weeks as a minimum. How frequently you need do this depends on a number of factors, size of tank, size of filter, number of fish, presence of plants etc. but for an established, reasonable sized, not overstocked tank every couple of weeks should be sufficient. Having an efficient filter (internal or external) will significantly improve the quality of the water (and reduce frequency of partial water changes to a degree) and improve oxygen and carbon dioxide exchange rates at the surface of the water (by the rippling effect of the outlet of the filter). 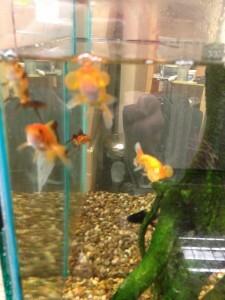 We do not sell goldfish bowls or recommend tanks without some form of filtration. It is possible to do without but it significantly increases the amount cleaning and water changes you will need to do and with the best will in the world people let it slip. In the end the fish suffers so we choose not to sell them. 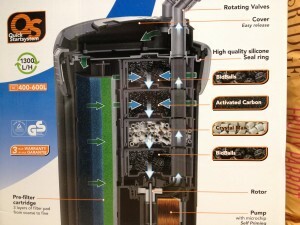 There are three main ways of adding filtration. Under gravel, using an air pump to drive water down through the gravel and up and over a tube, internal cartridge or element, probably the commonest form in small tanks and external cartridge or element, more usual in larger tanks. All work well and have their own benefits and drawbacks which we will not go into here. Any can be used with goldfish. Before putting goldfish into a new tank it needs time to mature. A week is normally sufficient. This is to allow the natural systems to establish before being presented with waste to dispose of. The process of maturation can be accelerated by the addition of the necessary bacteria in a liquid form. Fish should then be added gradually over a period of weeks to enable the bacterial cultures to grow with the increased waste load. Plants make an attractive addition to the tank and can also help use up nitrogenous waste but they are not essential. Fish do like to hide among them and eat some kinds but artificial plants can be used. Ornaments are at your discretion, they can provide hideaways for nervous new fish but again are not essential. Lighting is also not essential but does bring out the colours of the fish. If using real plants then the lighting is needed to encourage plant growth. Leaving the light on for too long can stimulate algal growth on the glass, gravel and any ornaments and plants though. We wouldn’t recommend less than a 25 litre tank for goldfish. 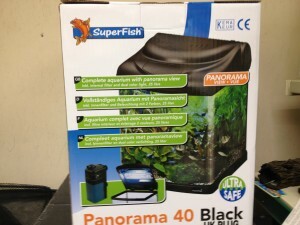 With regard to the number of fish there is no hard and fast rule but generally it is the surface area of the tank that dictates how many fish it can hold, rather than just the volume of water (larger surface area = higher oxygen exchange rate) so a shallower wide tank will hold more than a deep narrow tank. Goldfish are omnivores and eat a variety of food stuff. A good flake or pellet food is normally sufficient to provide all the necessary nutrients. Goldfish are quite hardy. All goldfish are fish farm bred nowadays and can tolerate a wide range of waters. Tap water in this region is medium to medium hard and pH (a measure of the hydrogen ion content of the water) is well buffered (resistant to change)at around 7.4 – 7.6. This is suitable for all modern goldfish and further treatment for pH and hardness is not normally required. Note that if water quality is not made a priority and the tank is not regularly cleaned pH can rise to high levels and effect the health of the fish over time. As long as you do not neglect your routine water changes this will not happen. However chlorine and chloramines are present in the water to keep it safe for us to drink and these need to be remove before being used with fish. Standing tap water for 24 hours will remove the free chlorine but will not remove the chloramines. You must use a chemical (Tapsafe, Aquasafe, Safeguard etc.) to remove these toxic chemicals (toxic to the fish – not you) BEFORE using the water. Avoid using real rocks unless purchased for the purpose from a reputable aquarist shop. Some rocks will significantly change the water quality to the detriment of the fish (limestone for example). Fake rocks are resin based and will not effect water quality. After you have bought your tank, set it up, let it mature for at least a week, you can add your fish. Don’t add more than one or two at a time. Check the fish in the shop for any obvious signs of disease such as a swollen body, damaged eyes or fins, sores, excreta stuck to the fish in a long line etc. The shop should carry out these basic checks in front of you and tick off each element of the inspection. When you get home, put the bag with the fish in into your tank (remember to remove some water first or you will have an overspill!) and leave it for about 15 minutes. This is for the temperature in the bag to equalize with that of the tank to avoid temperature shocking the fish (which can be fatal). Then remove the fish from the bag and put it in the tank. Do not bother to try to “acclimatise” the fish to the water chemistry by making holes in the bag etc.. It takes many days for this to happen and is just not practicable. Feed your fish daily. The food should be gone in 1 – 2 minutes maximum. Any longer and you are overfeeding your fish and this will eventually lead to problems. Check the fish daily for signs of disease. Carryout your water changes and filter cleaning and you should have a healthy fish for many years to come. Pop into our pet shop Gloucester for more specific advice on goldfish. This entry was posted in Fish, Health, How to, Pet care, Pet Shop Gloucester Blog Roll, Top Tips, Uncategorized and tagged angell pets, care sheet, fish, gloucester, gloucester pet shop, gloucester pet shops, how to, how to tips, pet care, pet food, pet food suppliers, pet food supplies, pet shop, pet shop gloucester, pets, pets for sale, pets shop gloucester, reptile shop, top tips by rangell. Bookmark the permalink.